Humans are undoubtably still changing. 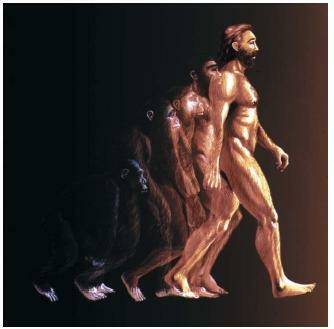 Culturally, technologically, intellectually and emotionally, humans have always been evolving. But are we still biologically evolving? Or have our cultural, technological, intellectual and emotional advances stopped genetic selection and biological evolution? Early homo sapiens could not possibly have envisaged the world in which modern day humans live, or our amazing technological capabilities, but have our changes had anything to do with genetics, or simply our developing culture? Check out the following story, and a panel discussion, on my podcast. It is arguable that we are no longer at the mercy of natural selection. We are now born into an environment that is largely of our own making – thousands of generations before us have helped craft a habitat in which genetic selection is largely unneccesary for our survival. No longer are only the healthy or rich breeding, or the strong surviving – babies with genetic mutations now survive childbirth and those of us who can not chase down wild animals can buy food from the supermarket. Reproductive technology has allowed many more people to breed than in the past. There is an argument that we are even causing "reverse evolution". Technology and medicine enables almost everyone to have children, preventing unfit genes from being purged from the gene pool. "Relaxed selection combined with a high mutation rate is probably causing gradual deterioration of many functions, especially disease defences," Gregory Cochran, adjunct professor of anthropology at the University of Utah, told New Scientist. With this in mind however, we need to take a look at the 2005 discovery of two genes by Bruce Lahn of the University of Chicago, one of which may have emerged as recently as 14,000 years ago and is now carried by 70% of the world’s population. The other may be as recent as 500 years old and is carried by 25% of the world’s population. Another example of recent genetic selection is in some parts of Africa where there has been an increase in the frequency of a gene which offers some protection against infection with HIV-1. And another very interesting example is the increase of the dopamine receptor gene DRD4. It is interesting because it is associated with attention deficit hyperactivity disorder and has somehow been selected for. So it would seem that there are still genetic changes that are being selected for occurring within the species. These are very interesting findings, as racial and ethnic groups diverged somewhere between 50,000 and 100,000 years ago, meaning that various groups across the planet may differ genetically to various degrees. It could be a massive political issue if different world races were not bioligically equal – one would hope we are culturally evolved enough to deal with it. But none of this should be much of a surprise. Our era of rapid technological progress, and hence a fast changing environment, is exactly the conditions under which natural selection should thrive. For example, the invention of dairy herding selected for a gene that gives adults the ability to digest milk sugars. These days however, we are seeing more and more that human technology and culture help humans “adapt”, where to adapt in the traditional genetic fashion would take hundreds or thousands of generations. And with the ability of technology to deal with our troubles rapidly increasingly, this will be an escalating effect. Given all this, where are we going to end up? Christopher Wills of the University of California, San Diego argues that our culture is the driving force in human evolution and has been driving the rapid evolution of the human mind. It began when it was the brains of our ancestors, as opposed to their physical attributes, that allowed them to succeed, and now Wills argues that in the modern world nobody can do everything, so the advantage lies in being good at something that not many others can do well. "My prediction is that we are not simply getting smarter, we are selecting for more variability in our behaviours," he told New Scientist. This is an interesting theory, as it means our culture is selecting for more variability within our gene pool, with this all pushing towards higher intelligence. Whilst Cochran thinks that we may be breeding out immunity to disease, he also thinks we may be selecting for intelligence – he recently published a paper claiming that natural selection has genetically increased the intelligence of Ashkenazi Jews in the past 1000 years, as they were forbidden to work in manual trades and had to make money in more ceregral activities (Journal of Biosocial Science, vol 37, p 1). Perhaps he thinks that our higher intelligence, combined with advances in technology, will more than make up for our increased vulnerability to disease. We should also not forget the role of sexual selection in evolution – that is, how we choose our mates - but we have already discussed this in a number of articles on Mr Science already. And we have not yet even dealt with the role of computing and artificial intelligence in evolution. With our concepts of what we mean by free-will and consciousness racing to keep up with developments in artifical intelligence, this is one area that could completely change our concept of evolution and what drives it. There will be a time when we start genetically changing ourselves and incorporating technology into our bodies. There may be a time when we create artifically intelligent robots, and indeed we may well change other animals to have some form of intellect. Our environment will be entirely of our own making. Evolution will always exist, indeed probably progressing at such a pace in the future that we can not imagine it at the moment, but undoubtably, natural selection as driven by “traditional” means will not exist. So where now for the human race? The October edition of Focus magazine published seven alternatives for the human race, some far sighted, some near sighted, some serious, some not. I suspect the future is a mix of all of them. Homo astronauticus – We colonise the universe, but travel between the planets we inhabit takes too long, so the selective pressures (environmental, sexual, cultural ect) of each planet takes hold and eventually various different species of humans inhabit the universe. Homo cyberneticus – Over time we enhance ourselves with computing parts. Eventually, nothing biological remains and our brains and consciousness are merely parts of a computing network. Homo hippocraticus – Casearean births have selected for babies with bigger brains and we have naturally become smarter. Eventually we correct genetic diformaties and become ultraintelligent and beautiful. Homo climatalogicus – We live in a world of rapid climate change, and that means we live totally enclosed in climate controlled glasshouses. Natural selection could not keep up with this change, but our technology could. Homo postapocalyptics – An asteroid hits the Earth, we blow up most of the Earth in a nuclear explosion, or there is some other catastrophy wiping out most of the population – only the strong survive on the post-apocalyptic Earth. Homo immortalus – Nanotechnology and genetic engineering combine to end all death. Will we live in an overcrowded world where we have to work forever, or has technology taken us to the stage where we no longer need to work at all, and we take massive risks, all in the knowledge that technology will save us? Homo tribalensis – Genetic engineering has made us a very vain race in which we select for beauty. We look good. Here is my video remembrance of Movember - the month in which a few of us grew moustaches to raise money for men's health. Yes, I realise that this is not particularly "sciencey", but its good fun. A big thanks to the other members of the team, who also feature in this video. The time lapse is not perfect, but some of the reflections, and some of the work of the other guys, particularly Adrian, are pretty funny. I quite liked my moustache, I miss the little guy. This is a message of thanks for a couple of companies. First off, a big thanks to The Podlounge for featuring the Mr Science Podcast on their homepage. You can see this feature here. Lots of love back to you, podlounge. And also a thanks to itunes, who recently rated the Mr Science Podcast top of their Natural Sciences section in the Australian store, after recently featuring it on their podcast homepage. Lots of love back to you also, itunes. Thanks again to those who subscribe to the show.